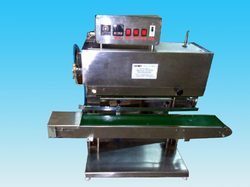 Pioneers in the industry, we offer continuous bag sealer machine from India. We are a leading manufacturer and supplier of Continuous Bag Sealer Machine. These machines are fabricated and manufactured using superior grade raw material and latest technology. Moreover, these products are appreciated for their high performance, efficiency, ease of use and durability. Available in standard as well as customized specifications, these have enabled us to acquire maximum level of client satisfaction. Looking for Bag Sealer Machine ?